Travelers often arrive at airports praying that the security lines won’t be too long or that they don’t end up in a middle seat. 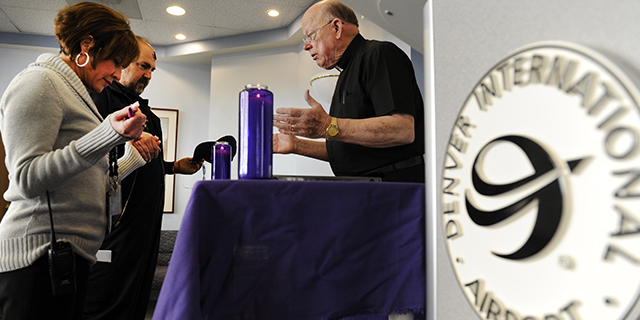 But at many of the nation’s largest airports, there’s a more spiritual setting for offering up prayers – a chapel. In fact, more than half of the nation’s busiest airports have dedicated chapels, and many of these facilities offer a variety of worship services for different faith traditions. The first U.S. airport chapel, Our Lady of the Airways, opened at Boston’s Logan International Airport about 60 years ago. Since then, airports all over the country have added spaces for prayer, worship and meditation. While most airport chapels are designated as interfaith spaces, some airports provide facilities for specific religious groups. John F. Kennedy International Airport in New York, for example, has four places of worship: a Catholic church, a Protestant chapel, a mosque and a synagogue that is reputed to be the only one in a major airport in all of North and South America. Dallas/Fort Worth International Airport, meanwhile, has five different interfaith chapels – one in every terminal. Our count only includes those airports the Federal Aviation Administration classifies as a “large hub.” These are airports that handle 1% or more of the nation’s annual passenger boardings. 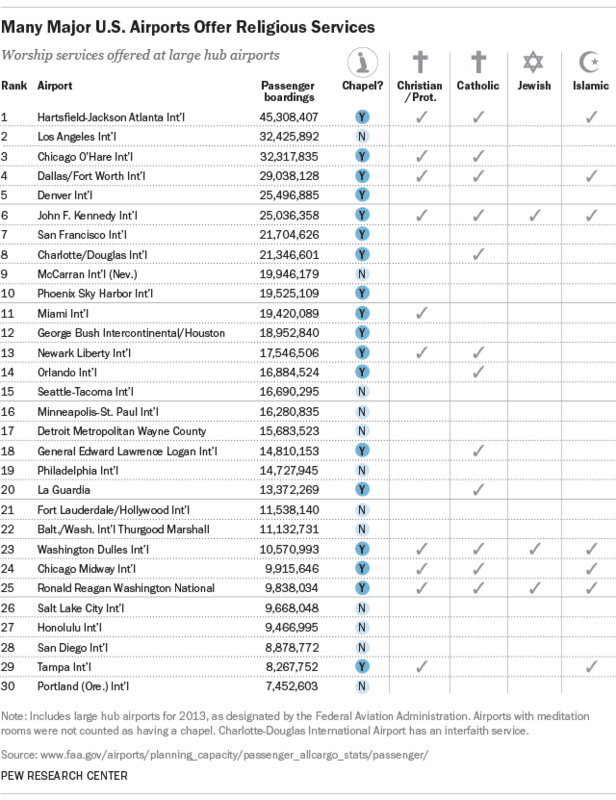 Thirty U.S. airports qualified as large hubs in 2013, the most recent year for which data are available, ranging from Hartsfield-Jackson Atlanta International Airport (the busiest in the nation, with more than 45 million passenger boardings) to Portland (Ore.) International Airport, which accommodated 7.5 million boardings in 2013. Of the 30 large hubs, 18 (60%) have chapels or prayer rooms. Among the 12 that don’t have space for worship are some of the nation’s most important airports, such as Los Angeles International Airport (the second-busiest in the nation) and McCarran International Airport in Las Vegas. While four of the 18 major airports with chapels offer no formal services, the rest (14) offer at least one type of organized worship, and many of them offer more than one kind of service. For instance, Washington Dulles International Airport, near Washington, D.C., offers weekly Catholic Mass, Protestant worship and Christian prayer services, as well as daily Jewish and Muslim prayer services.